I truly believe in the saying "Less is More" when it comes to makeup. However, not all of us are born with naturally great looking skin. As we age, our skin just changes and start having problems. I am no exception to this fact. So, I started trying out a combination of skincare and makeup products that helped me look like I slept 8 hours every single day (which is actually very rarely. hahaha). I got the inspiration for this topic when I stumbled on the Glossier website. 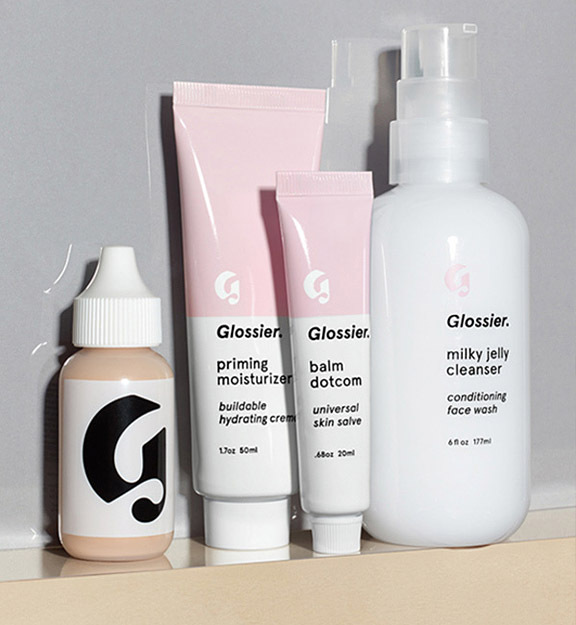 It says "Get Glossier, your go-to products for instantly dewy, glowing skin." And that is what I always wanted for my skin. I was glad to see that they offered a set of beauty products which already has everything you need to get that natural glow we all want. 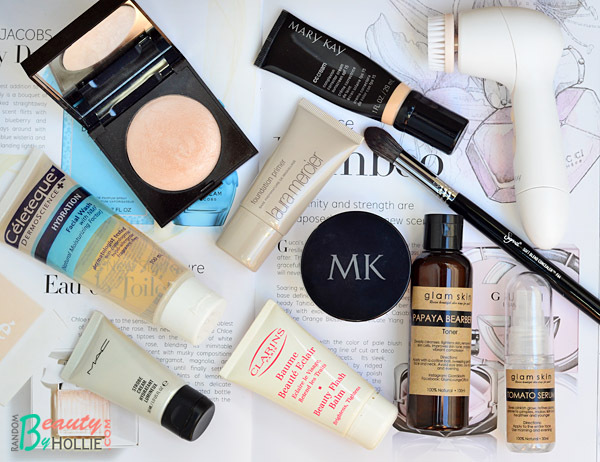 So, I just wanted to share with you my version of go-to products for a healthy and glowing skin. I do follow the usual rule of thumb which is to Cleanse, Tone and Moisturize. 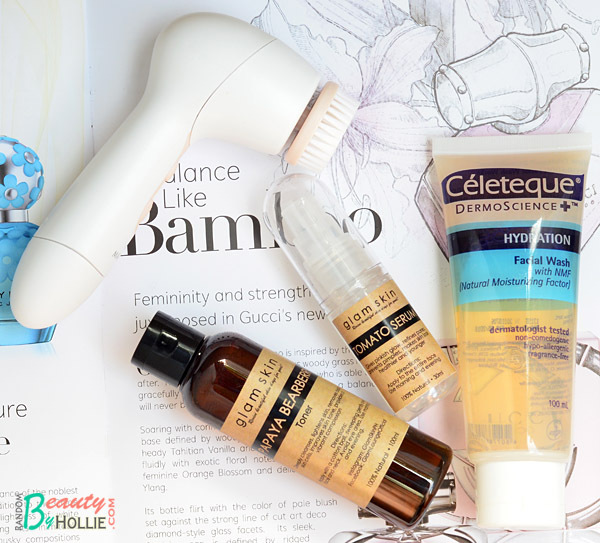 I first start by washing my face with the Celeteque Hydration Facial Wash. I've been using this wash for years and I really like that it is mild, unscented and cleans my face well without leaving it dry. 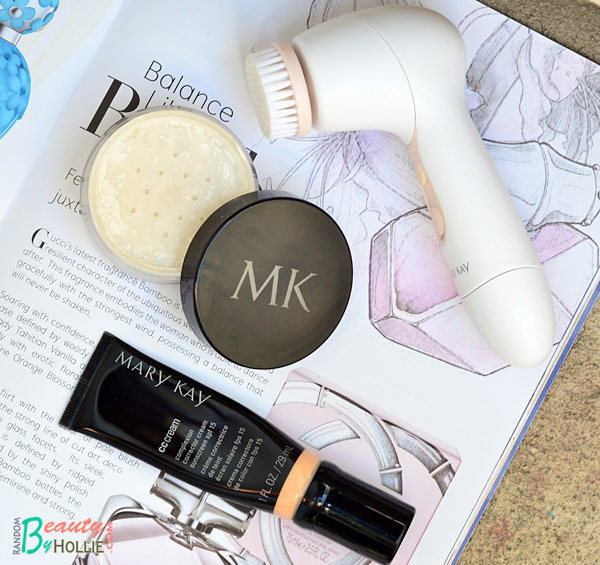 I use the Mary Kay Skinvigorate Cleansing Brush twice a week when I want to deep clean. Then followed by the Glam Skin Papaya Bearberry Toner. This is already my third bottle of this toner and I love it. It cleans my face and help even out my skin tone. It does not sting and has a really nice mild scent. I then follow it with Glam Skin Tomato Serum which helps refine pores and make my skin look healthier. This has a watery, gel-like texture and absorbs on my skin really well. In case you are wondering Glam Skin products are organic and made from natural ingredients. After my skin care routine, I then prep my skin with any one of these face bases. I am a fan of dewy make up look and these three help me achieve that finish. I prefer to use the Laura Mercier Foundation Primer, when I want to use a liquid foundation. It hydrates my skin really well without making my foundation look blotchy. I highly recommend this primer to those with dry skin. Then there's the Mac Strobe Cream, which I enjoy using on rainy days. It helps give my skin that extra glow. I sometimes mix the Strobe Cream with a liquid foundation to sheer it out and at the same time give that dewy finish. If I use this as my primer or moisturizer, I only apply it to certain areas on my face. This is best paired with a really sheer powder like the Mac Mineralize Skinfinish Natural. 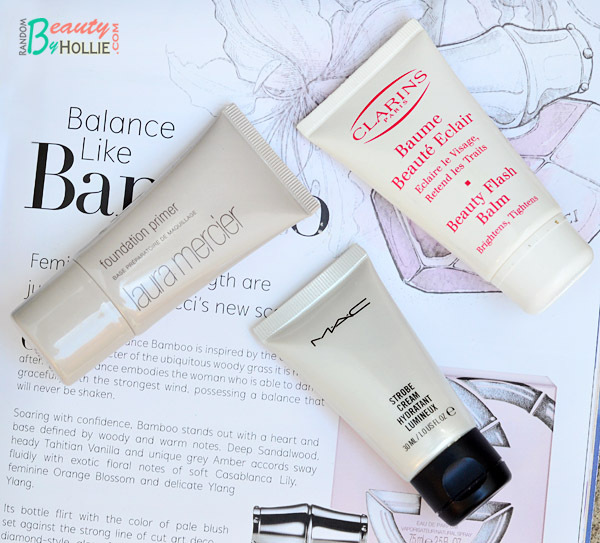 My favorite face base would have to be the Clarins Beauty Flash Balm. I've had this for years and the one in the photo is still in the old packaging. It literally took me years to finish the whole tube since I only need a pea size amount to apply this on my face. I love using this as a base for my Mac Studio Fix powder on certain days when I just look dull, tired and ghastly! LOL. It totally does what it claims, it brightens and tightens my skin. I enjoy using the Mary Kay CC Cream since it is already a combination of skin care and makeup. It makes my skin look even and healthy since this has a dewy finish. I just apply this all over my face, then I just dust a bit of Mary Kay Translucent Loose Powder on my forehead, sides of my nose and under eye area. Then I just groom my brows and wear a sheer lipstick for a natural makeup look. 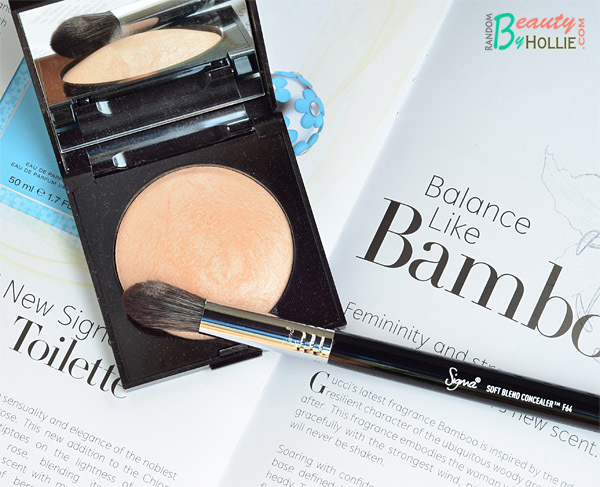 Lastly, to add that extra oomph to my skin, I highlight the center of my nose and high points of my cheeks with the Laura Mercier Matte Radiance Baked Powder in Highlight 01 using the Sigma F64 brush since the size is perfect for highlighting. This highlight powder is just perfect for a natural glow. It is finely milled and blends on my skin really well. I hope you'd tell me you secret to healthy glowing skin as well. I have yet to do my favourites! hi miss! how much is the mac strobe cream? Hi Rae, thanks for dropping by. The full size tube costs Php 1,800.. two years ago, I am not sure if the price is still the same. The one in my photo is a travel sized tube which was given to me by the MAC people. @CJ I knowwww, it's every prettier in person! it just really gives a beautiful subtle glow.